A client in the nuclear power generating industry requested a sensor that could accurately map the internal surface of critical piping in a nuclear power plant. To make matters more complicated, the laser scanning sensor needed to operate in an underwater environment, and they needed it in only a few weeks. LTC engineers worked in coordination with our client’s engineers, and in only a few weeks, delivered a field-hardened, watertight sensor that could be controlled with our customer’s robotic manipulator. 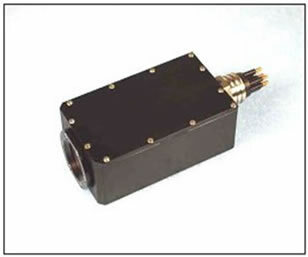 Our LP-2000™ data acquisition system was easily interfaced to the manipulator and the result was the generation of high-resolution laser profile data in a harsh water environment. 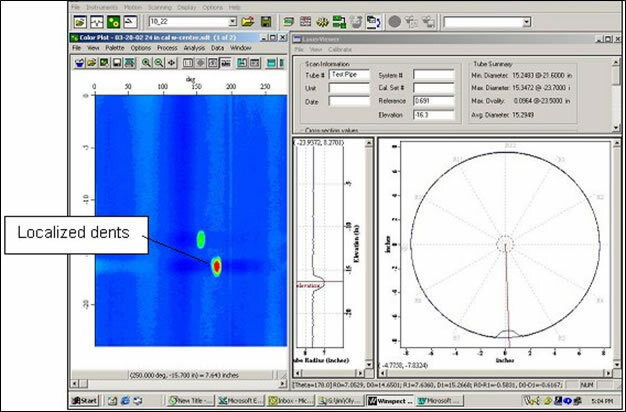 The figure below shows an example of laser profile data taken on a 16 inch (406 mm) diameter pipe. In this case, two inner surface dents have been located and mapped. The dent being displayed in the cross sectional view is 0.5831 inch (14.81 mm) deep.